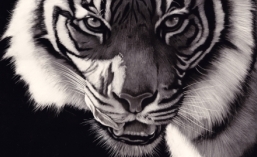 Here’s a recent small scratchboard piece of mine which is designed to create debate on zoos. I’ve already written a blog about good zoos and bad zoos. There are many many good zoos that do invaluable work in research, rehabilitation and education. Heck, for anyone who watched ‘Last chance to see’ with Mark Carwadine and Stephen Fry, they would have seen that zoo in Czeckoslovakia which released four northern white rhinos back into the wild. There are 8 of these magnificent animals on the planet and not one of them was in the wild. They were, to all intents and purposes, extinct, but thanks to a zoo, there is now a chance for them. Many other zoos are doing similar things and even if they aren’t, as long as they educate the public on animals and their plight, the goal is achieved. There are bad zoos too. Unknowingly I went to the Cairo Zoo which is simply a disgrace. Animals kept in tiny cages, elephants chained to the ground, terrible care by the keepers and authorities etc etc. Just a very poor culture surrounding animal care. However, one thing can often be seen even in a good zoo. This gibbon was in a zoo which I was visiting and it was sitting behind glass in a brick room looking unbelievably bored. It’s often dangerous to use the word ‘bored’ with an animal. That is anthropomorphisation, the giving of human characteristics to animals. It may be just the way it is but it sure looked bored to me. It sat there staring into nothing for ages. It was still in the same position when I walked past it an hour later. It would take a deep breath every now and then and a big exhale, just like we do when tedium sets in. Further inspection showed it had access to a very nice compound outside the room so why wasn’t it out there doing what gibbons do best? Swinging through the trees (swinging on the ropes). Research shows that gibbons can swing through the trees at speeds up to 35 miles per hour (56 kph) which shows that they need massive territories. A few swings, even in a well laid out facitily as this was, and it’s been round the lot. That must get very boring very quickly. Maybe, maybe not. Maybe it’s just the way it is. One thing is for certain, if I, as an open minded thinker, think such things, imagine what school children think or other people who think all animals should be in the wild. Is there a way for this to be overcome? I have heard of one zoo at least putting a sign next to the orangutans reminding people that their facial muscles aren’t the same as ours so they will look sad more often than not, even when they aren’t sad. However, this seems like a less proactive step to me. 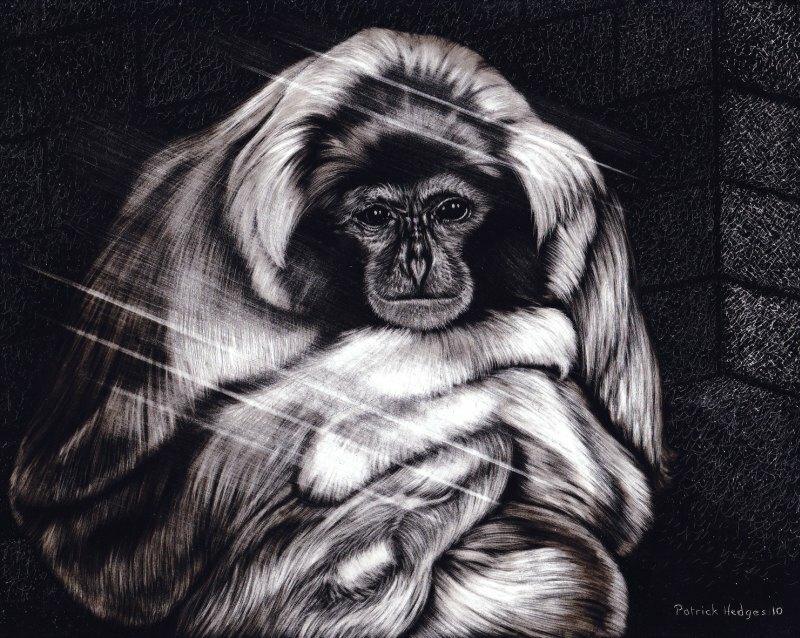 This is the “Pileated Gibbon” in question, rendered in scratchboard. It’s a hairy animal and looks like it was snuggling up for warmth but it wasn’t since it was a lovely warm day.